Did you ever notice that when you get luncheon specials at a Chinese restaurant you get a choice of soups to go with your main entrée? The choices are always the same: hot & sour or egg drop soup. Wonton soup if you’re lucky – and fancy. I almost always go for hot & sour soup because it’s complex and yummy and not something I would make at home (yet). I usually pass on egg drop soup because it’s kind of boring. Don’t get me wrong, I think it tastes really good, but never thought it was anything special. 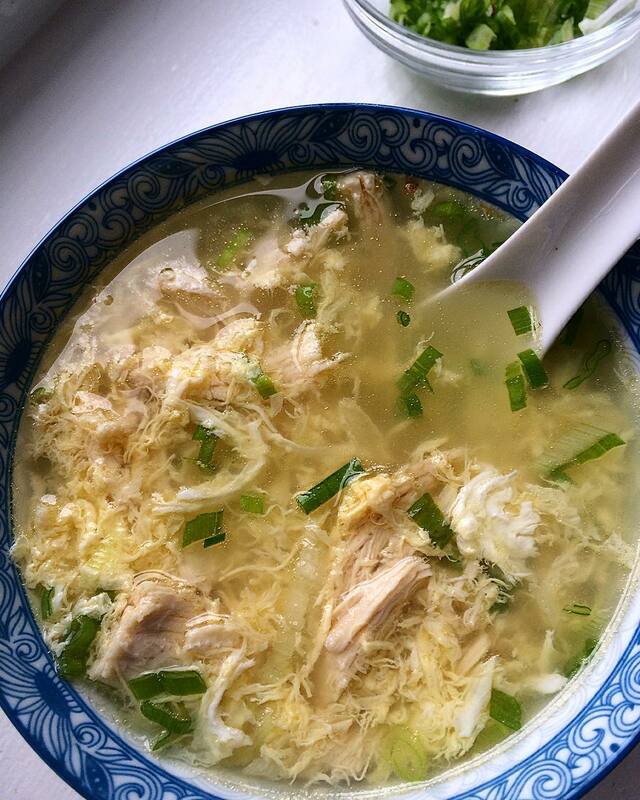 Poor egg drop soup always gets overshadowed by hot & sour and just sort of fades into the background. Anyway, I’m glad I gave the soup a try. Really simple and easy to make and perfect for a rainy, feeling kind of blah day. Between my son and I, we had enough for the two of us and I could tell he was starting to feel better when he went back for seconds. After finishing my soup I found myself wanting to apologize to all the luncheon special egg drop soups I rejected in the past for making them feel like second best. Smash 6 scallions and cut into 2-inch pieces, then put in a 2-quart saucepan with water, broth, ginger, and 1-1/2 teaspoon salt. Bring to a simmer, then poach chicken at a bare simmer, uncovered, until just cooked through, 12 to 15 minutes. Transfer chicken to a cutting board and let broth steep, covered, 10 minutes. Meanwhile, chop remaining 6 scallions and shred chicken. Discard scallions and ginger from broth and bring to a brisk simmer. Add beaten eggs in a slow stream, stirring constantly with a fork. Remove from heat and stir in scallions, chicken, and white pepper (if using). Serve drizzled with sesame oil.